Show Us Where You Live Friday - Lots of Rooms! It's another edition of Show Us Where You Live Friday! I missed last week, so I'm going to catch up this week! Last week was bathrooms and this week is laundry, bonus and playrooms! I don't have a bonus room, but I do have all the others! And again, I have already posted these pictures, so I'm going to leave you with links to all the previous postings. Hope you enjoy the tour! Follow THIS LINK to see my girl's bathroom. It's a jack-n-jill style in between their bedrooms. Follow THIS LINK to see Nana's bathroom. I have already shared this bathroom when I showed her bedroom - they were both on the same post. But here it is again in case you missed it! Follow THIS LINK to see the half bathroom. It's red and I love it!! Follow THIS LINK to see my laundry room and our cubbie area as you come in from the garage. And now the playroom. I just realized today that I had not posted pictures of our playroom. 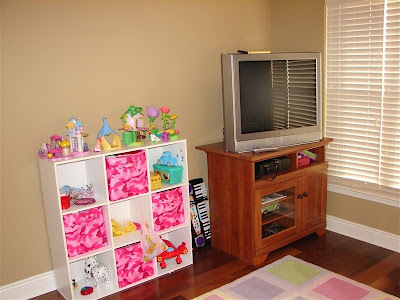 When I did the tour back in November, our playroom looked like this and this and this. You see those posts were posted the first of September and that room looked like that until DECEMBER! Very frustrating. The front of the house STILL isn't completely finished today!! But that's another blog post for another day. Now, onto the playroom! Here is a photo of the door. It is immediately to the right as you come in our front door. This is a shot of it from the dining room. This is what you see when you are looking through the doorway. It's not a very big room, like 10x10 I think. 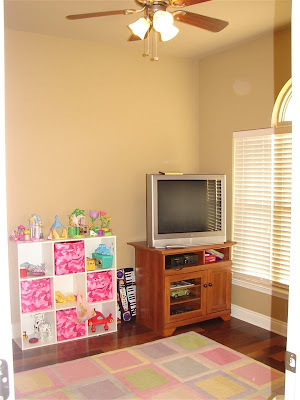 But, once we don't need a playroom, we will turn this into our office. Another shot from the corner right behind the door. It is really nice to have a space for all of their toys! Another view from the opposite corner of the doorway. 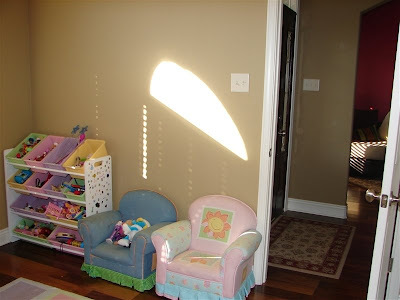 You can see a little of our front door there in the left side of the doorway to the playroom. I took these pictures this morning and the sun comes up on this side of the house. It is always very bright in here in the mornings. Here is a view standing in front of the large window. 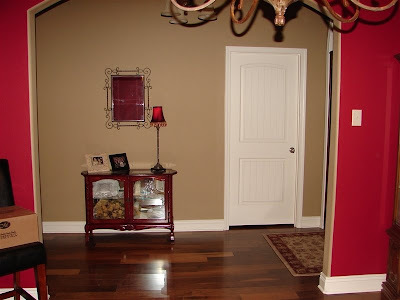 On our original house plan, this room didn't have a closet in it. I knew I needed the closet space, so I added two! We pushed the room out more and added these. I am so happy with that decision!! 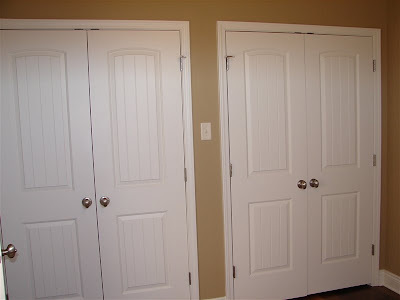 This is the closet on the right. 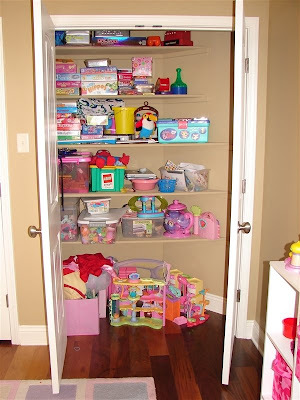 This is the girl's closet for all of their games and toys. I love all the shelves! This is the closet on the left, right behind the door to this room. This is MY closet. 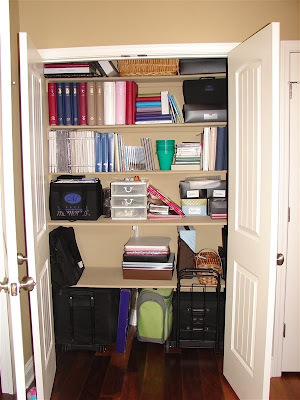 This is where I store all of my scrapbooking stuff. I had these shelves custom measured to fit my bags and albums - and they fit like a glove!! I have a table set up right now in the dining room and some of my stuff in on it. So, everything isn't in the closet right now. Wish I wasn't so far behind on my albums!! Someday, someday I will get caught up!! Well, there you have it. I hope you enjoyed the tour and come back next week for the master suite tour. Have a great weekend! Today was a very special day in our family. Tonight as we were putting Rachel to bed, she told us that she wanted to get saved. We talked for a long time about what it all meant, talked about scripture and did our best to answer the questions she had. Her spirit seemed ready and I was able to lead her in her prayer to ask Jesus into her heart. Both her Daddy and I are so very proud of her and her decision to follow Jesus. This day couldn't have been a better day. Her decision to as Jesus in to her heart made a once dark day in my life much brighter. You see, it was 27 years ago today that my Daddy went to be with Jesus. I was only eight years old. Every year on this day, I can't help but reflect on his passing and it would always make me a little sad. Over time, the sadness has lessened, but the hurt is always there. Now, this day has a whole new meaning. It is the spiritual birthday of my first born daughter. It is now a day that will always bring a smile to my face and make my heart happy. My daughter is now my sister in Christ and a child of God. I know I will live forever with her in heaven. This makes me extremely happy. 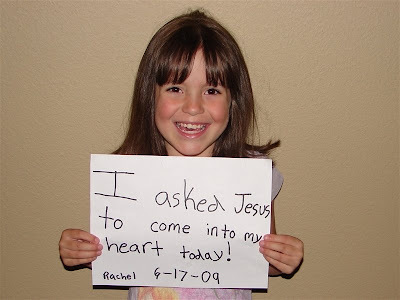 Rachel, I love you and I am so very proud of your decision. You are growing up so fast and I pray that God will use you in a mighty way. I know He has great plans for you. Always trust Him, seek Him, serve Him and love Him with all your heart. It's Friday and you know what that means! Another Show Us Where You Live Friday. This week is Home Offices. Currently we don't have a separate room for our home office. We are using part of our breakfast area. It works great right now. 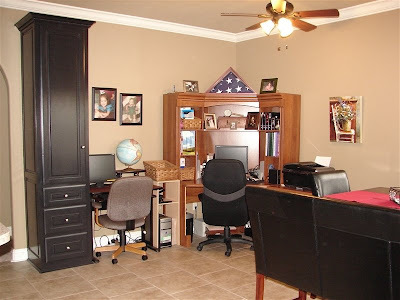 Our plans are once the girls are older and we no longer need a playroom, we will convert it to our home office. But for now...this is it. The large corner desk is my work station. I work from home part time for my best friend and their real estate business. I enjoy it a lot and like being able to contribute some to our monthly income. The smaller desk to the left of my desk is the girl's computer. They both love to play on the computer and it is nice for them to have their own - now they don't fight to use mine. However, they do fight to use theirs!! We have to set a timer and it is a great exercise in patience and taking turns. Thanks again for stopping by on this tour and I'll see you next week!